Imagine working long days and not coming home with enough money to support your family. Then imagine working to pay for a truck that you cannot afford, but have to fund in order to work the next day. 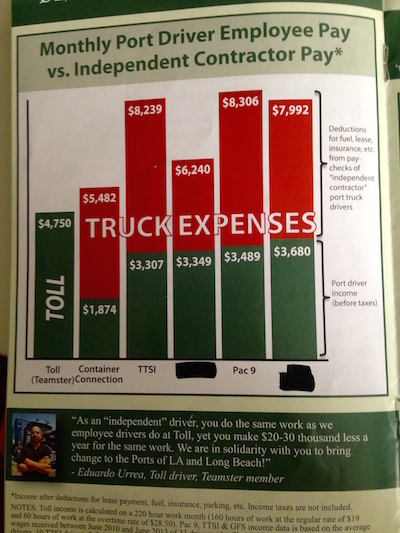 This is the reality for more than 50,000 misclassified port truck drivers nationwide, according to the Long Beach-based coalition Justice for Port Truck Drivers. This number includes “over 10,000 drivers who operate in and around the ports of Long Beach and LA, and the majority of them live here in our communities in Long Beach – Wilmington, Carson, [and] Compton,” according to Ernesto Rocha, a community organizer at the Los Angeles Alliance for a New Economy (LAANE). Julio Salamanca, a trucker for 15 years, said he is misclassified as an independent contractor at a company he has worked at for nine years. The Long Beach and Los Angeles ports are some of the busiest in North America, responsible for approximately 40 percent of the nation’s incoming cargo when combined. Port truck drivers are an integral part of the U.S. economy, yet they are struggling to make ends meet. About two-thirds of the port truck drivers are suffering from wage theft in addition to misclassification and do not have a voice to speak out, according to the “Big Rig Overhaul” article from LAANE, the National Employment Law Project, and Change to Win. Jose Gama, a labor organizer with local Teamsters, works to help port truck drivers fight unfair labor practices like wage theft. According to Gama, some companies, including those who employ these Long Beach truckers, inaccurately classify their employees as independent contractors to avoid having to pay their own taxes and save themselves money. “Because the port truck drivers are misclassified as independent contractors, and not employees, they are unable to form a union,” Gama said. According to the U.S. Department of Labor, companies that misclassify their workers end up saving about 30 percent of costs. The drivers are left without important employee benefits such as health insurance and are forced to make many payments on leased trucks from their company. Wage deductions from the truck companies can pile up, something Salamanca knows first hand. He had $1,000 worth of deductions taken from one week’s paycheck and was left with only $60. Salamanca’s truck needs $500 worth of repairs, and he cannot work if he does not fix the truck. But without work, he cannot afford to fix the truck. It is a vicious cycle. Trucking companies often control the hours that the drivers work, despite the fact that if the drivers were true independent contractors, they would be able to control the hours that they work. According to the Internal Revenue Service (IRS) independent contractors are considered self-employed and therefore determine when they work. Port truck driver Abraham Hernandez said his company does not want the drivers to fight for their rights. The newlywed said the slow work and decrease in hours is hard on his family because his wife only works two to three days a week and sometimes he only works four days a week. Hernandez’s lack of work is due in part to his alignment of Teamster efforts to unionize port drivers. “I support the Teamsters in helping the drivers who want to form a union, and my company gives me less hours and work, which affects my income,” said Hernandez. Hernandez says that his misclassification as contractor makes it hard for him to make ends meet and avoid going into debt. It is just Hernandez and his wife for now, but Hernandez does not let his money troubles hold him back on the thought of providing for his future family. Hernandez’ grandmother used to tell him in Spanish, “Un donde come uno, como otro,” which roughly translates to “When somebody eats, another person can eat.” The truck driver said this phrase reminds him that if he and his wife have enough, they can also provide for others. Long Beach port truck driver Neptali Tolledo believes he also been a victim of wage theft and misclassification. For a while, Tolledo was the only one financially supporting his family, and expenses like his daughter’s college tuition caused financial struggles. “It didn’t affect the food on the table, but we were limited in our spending money and had to be very cautious of what we spent it on,” Tolledo said. The port truck drivers spend long hours waiting in lines at the ports to pick up cargo, which makes for long days of work, and often not much money to show for it. The drivers are paid for the number of loads they deliver, not for the actual hours spent at work. Other drivers shared stories of spending all day waiting for cargo and coming away with nothing. Francisco Valencia said he was never paid for working overtime and is joining the fight to form a union with his fellow port truck drivers. Despite his challenges, Valencia continues to be hopeful for health insurance for his entire family, a retirement pension, and most of all, to have respect and dignity in his workplace.